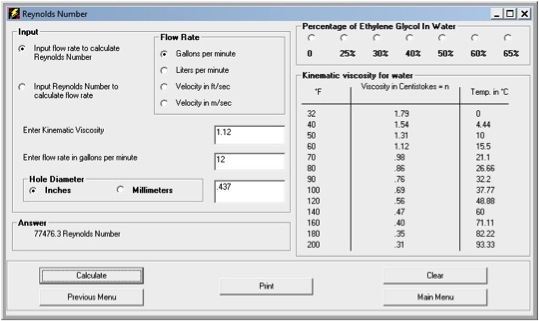 Make sure that your cooling is maximized by achieving a flow rate that indicates a Reynolds Number over 4000. Make sure that your hydraulic lines don’t exceed a Reynolds Number of 2000. See how anti-freeze hampers your mold cooling by increasing the coolant viscosity! You can sometimes increase cooling, in marginal situations, by warming the water temperature. When the Reynolds Number is near 4000, and you can’t increase the flow rate, increasing the water temperature can sometimes change the flow from transitional to turbulent due to the decreased viscosity.